Indigenous Peoples around the world and our allies often reflect on the many challenges that continue to confront us, the reasons behind health, economic, and social disparities, and the best ways forward to a healthy future. This book draws on theoretical, conceptual, and evidence-based scholarship as well as interviews with scholars immersed in Indigenous wellbeing, to examine contemporary issues for Native Americans. It includes reflections on resilience as well as disparities. In recent decades, there has been increasing attention on how trauma, both historical and contemporary, shapes the lives of Native Americans. Indigenous scholars urge recognition of historical trauma as a framework for understanding contemporary health and social disparities. 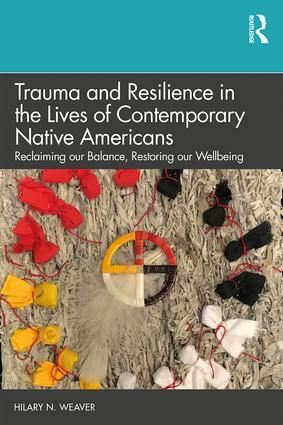 Accordingly, this book uses a trauma-informed lens to examine Native American issues with the understanding that even when not specifically seeking to address trauma directly, it is useful to understand that trauma is a common experience that can shape many aspects of life. Scholarship on trauma and trauma-informed care is integrated with scholarship on historical trauma, providing a framework for examining contemporary issues for Native American populations. It should be considered essential reading for all human service professionals working with Native American clients, as well as a core text for Native American studies and classes on trauma or diversity more generally. Hilary N. Weaver, DSW (Lakota) is a Professor and Associate Dean for Academic Affairs in the School of Social Work, University at Buffalo (State University of New York). She received her BS from Antioch College in social work with a cross-cultural studies focus and her MSW and DSW from Columbia University. Her teaching, research, and service focus on cultural issues in the helping process with an emphasis on Indigenous populations. Dr Weaver received funding from the National Cancer Institute to develop and test a culturally grounded wellness curriculum for urban Native American youth—the Healthy Living in Two Worlds program. She is a member of NASW and CSWE, and currently serves as President of the Indigenous and Tribal Social Work Educators’ Association (formerly American Indian Alaska Native Social Work Educators’ Association). Dr Weaver has presented her work regionally, nationally, and internationally, including presenting at the Permanent Forum on Indigenous Issues at the United Nations in 2005-2008 and 2013-2018.